Total saved 7554 frames than my old run. Because I success to carry out a new plan and fix some error. In this run, I didn’t take any useless chips for chip-trade. Help me save a lot of frames. Run’s speed is as twice as walk. For example, if megaman walk to east, then screenX speed is 1,Yspd is 0, ↗spd is 0.5, ↘spd is 0.5, step spd is 1. 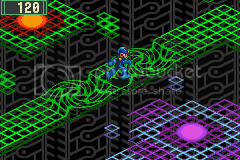 If megaman run to east, then Xspd is 2,Yspd is 0, ↗spd is 1, ↘spd is 1, step spd is 2. 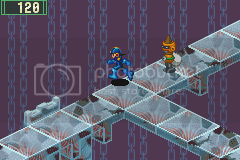 When megaman run to north, Xspd is 0, Yspd is -2, ↗spd is 2, ↘spd is -2. When megaman run to northeast, Xspd is 2, Yspd is -1, ↗spd is 2,↘spd is 0. When megaman run to southeast, Xspd is 2, Yspd is 1, ↗spd is 0,↘spd is 2. When running, press up B or press up pad 1frames will lost 2frames, turning will lose 1frames. So in this game, when going from west to east, go straight is not the best way to through. In most case, going from west to east cost the same frames (no more than 1 frame) as going to northeast and turning to southeast. What’s this 1 frame different? It’s turning counts. So in this tas, I always chose the lest turning way. e.g. 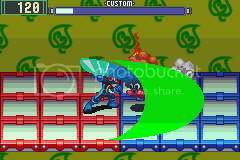 If megaman face to NorthEast and want to go from A to E, the best choice is A to C first, and turn to E. If go A B D E, megaman should turn twice, and 1 frame slower than go A B C D E.
How to avoid random battle? 1st choice, press A before meet battle 1 frame. This is the best way to skip random battle, can’t cost any frame. But it’s not always work. 2nd, turning and then press A before meet battle 1 frame. Only cost 1 frames, but make sure no need to turn back again. Why not only turning? Because if the battle which turning can skip, pressing A must skip, too. 3rd, press up pad 1 frames and then turning. Cost 2 frames. Like the 4th avoiding battle, but save 1 frame when you must turn. 4th, press up pad 1 frame. 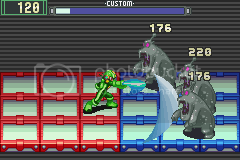 5th, press up pad 1 or 2 frames and press A before meet battle 1 frame. No matter what happened, don’t forget press A! What’s about press up B? In my test, I didn’t find any chance which pressing up B can skip balte and press up pad can’t skip (press A, press A, don’t forget), but pressing up B cost the same 2 frames as press up pad. And when pressing up pad, the step counts is 2 short than pressing up B, maybe have chance to skip the last random battle. So in most case, no need to press up B. 6th, press up pad 1 frames twice or more, don’t forget try to press A later. 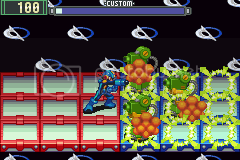 Wait more than 2 frames between these two pressing up pad. If meet the very bad luck, have to do it. Why divide it into twice or more? Because I can get the less step counts than press up pad few frames, maybe skip the last random battle. M-BurstPA: power 100*10. This is the first and second hit, every 9frames 1hit, 10 hits in all. SilverFist: While holding A, input these key sequences to activate special function of corresponding fist. f,u,b,d,f Effect: 1 rocket punch on each row. Varsword: While holding A, input these key sequences to activate the corresponding function. Prism: copy damage and hit around. Can’t make boss be invisible. 1. In the mother1 computer, there is a focus battle. But pass start and view the chip can avoid this battle. Suggest: check option-> video->disable SFX, when watch the run in the mother1 computer. Don’t forget uncheck it later. 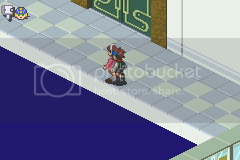 When I tas exe3, I found it, and found this can be used for all megaman battle network games. I can go through obstructive NPC and Mystery Data. But can’t through the story wall. This glitch only happened on going through SW ↔ NE or NW ↔ SE. When being close to NPC, press the negative direction key. Prism+Varsword is fast than any PA. Pass ←B→B, varsword can hit prism 5frames(times) first, only if wave don’t hit bossbody, boss wouldn’t be invisible. It can hit 3×5×160=2400 in all. Prism+Treebomb Glitch is only in Japanese versions. There are 2 chip-trades which I used in this tas. Marine Harbor Upicial Center Chip Trader (put in 3 chips, and get 1 chip. 3-c-t), and Netopia Chip Trader (10-c-t). There are 4 factors control chip-trade’s results. RNG is the most mainly reason. With the story’s progress, player can get the more type chips from chip trader. Before beat Thunderman, I can’t get any Prism from 10-c-t.
After beat Thunderman, I only get 2 types of Prism, PrismC and PrismN or PrismQ? Sorry, I forgot. After Lan’s Passport back, I can get more types of Prism, but there no PrismB in 10-c-t.
After beat Snakeman, I finally can get PrismB from 10-c-t. But this chip is very very few, about every 3000 frames appear once. The larger library the more type chips in chip-trader. For example, because I have got Varsword, RollR and recov120 these high level chips, so I have more chance to get these same chips from 10-c-t.
Before get Poimask, there are only PoimaskW and PoimaskZ in the 3-c-t, so I have to got PoimaskZ first. After got PoimaskZ, it’s possible to get PoimaskS. After complete the game, there’re have the very large chance to get the chips which haven’t got their ID in 10-c-t.
What? Really? Yes! Though the BBS said ‘Chip traders don't give better chips depending on what you put in! The chips you get are all luck.’ It’s like a word play. ‘Don’t give better’ is not equal to ‘effect the result’. For example, after got PoimaskZ, I put it into back to the 3-c-t straight away. Because it can be got more chance to get PoimaskS quickly. When I used 10-c-t to get PrismB, I can’t put Roll2R into 10-c-t. If I do it, I will fail to get PrismB, which I got is Roll2R, too. So I have to edit chips and put Roll2R into the chip folder. It seemed Capcom is very considerate. Roll2 chip is very rare in this game. If we put it into chip-trader negligently, don’t worry, we have the large chance to get it back from this or other 10-c-t. May Someone test atk30+ or ZeusHamr? When edit the chips, press Select to choose a default chip which MB is lower than the folder’s MB. This chip would appear in the first of battle chips. The chip atk+10’s MB is 4, equal to the lowest the folder MB. So this chip is the best choice as default chip. After use the default chip, the original slot sequence has been broken. So I have a one more chance to manipulate luck. But it’s only ‘one more chance’, because choosing slot0 as the default is equal to choose other slots as the default, the only different is slot0 and other slots be exchanged. I only use once select-default-chip in this tas. 2000 0:00:35 Homework At the 3rd battle, I shot Mettaurs 46 times for manipulate luck to get 1500Z from first GMD(green mystery data) in the first time. 11100 0:03:12 Shopping Buy spreaderQ(1000Z) from Den Area 1 Netdealer, left 500Z. 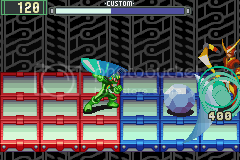 The first spreader chip, though cost nearly 600 frames, in my this plan, this chip is very important for Quickman. 12700 0:03:34 Get 1500Z again, left 2000Z. I didn’t get any BugFrag, because I need use it for manipulate luck. 15100 0:04:18 Get crossgunJ x2(600Zx2), wideswordL(800Z), left 0Z. I don’t have enough money to buy the 2nd wideswordL. Only 2 wideswordL is very hard to manipulate luck in the future, but buying crossgunJ x2 is too much more important. If not get crsgun x2, I can’t complete virus battle in one turn. 22233 0:06:12 Airman 1st edit chips for next 2 battles. swordS 80x4=320, get 1000Z, left 1000Z. I have no money to buy 2 wideswordL, so I have to use swordS x4. 24100 0:06:46 Jack in Phone Get 1000Z from BMD first, left 2000Z. Try to find the virus Fishy, and get important chip DashAtkJ. I use tas-movie-editor to make this battle happen near the exit. I meet the bad luck, have to delete them one by one, and can’t take damage to reduce the level to 7. If I take damage, I can’t got chip DashAtkJ, only get HP recover. Why must get DashAtkJ? This chip is not used for battle, is used for trade to spreader*. As long as get this chip, I don’t need to Jack in Blackboard to get swordL. Shooting one time in battle can make RNG point+1. If I want to skip edit-chip, I must wait for slot2: atk+10 and slot25: atk+10 appear together again. I tested that get BugFrag or not, whether got 1500Z from GMD first or not. And sure beat virus first, only need to wait about 30 frames. After battle, get 1500Z, left 3500Z. The hardest 5 battles! I have try my best to use the most atk+10, but I can’t avoid the last battle appear the repeat chips, so I lost some frames in the 5th battle. 46500 0:13:01 Trade Use DashAtkJ trade for spreader*. H-Burst PA complete! 49900 0:13:58 Bear 4th edit chips. Spikey, Spikey, Spikey(13 1wswdL 16atk 3wswdL 27atk)Get chip HeatshotB. 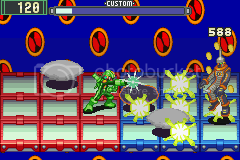 65200 0:18:14 Quickman BOSS Quickman 400HP(0 18 15spd* 13psdQ 19spdO)H-BurstPA 100x5. Very luck! 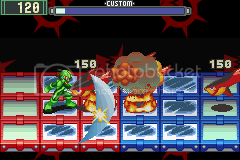 I didn’t manipulate luck, Quickman always go to the perfect place that H-Burst’s every hit can damage him. 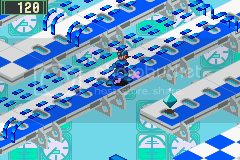 70200 0:19:38 3 Chip Trader Get DashAtkG poismaskZ poismaskS. A perfect luck. I want to get BrnzFistB, but only BrnzFistN and BrnzFistS in this 3-c-t, and BrnzFist is fewer than poismask. I give up. 72500 0:20:17 mission1 Spikey2, Spikey2, Spikey2(1wswdL 5atk 10 22VgunL 9)Get chip Heat-V S.
Flamey2, Flamey3(3wswdL 1wswdL 16 24 27)Get money 500Z. Handy, Handy, Handy(8 16 9 3wswdL 4)Get chip TimeBom1. I have only 2 wideswordL, so I have to change the sequence to manipulate luck. 83800 0:23:26 mission3 Get BugFrag from BMD. I must complete mission3 before do mission2, because This is my last chance to get BugFrag, I need use this BugFrag to trade spreaderM when being in mission2. 91300 0:25:32 mission2 Get spreaderN from GMD. 93400 0:26:07 Use BugFrag trade spreaderM. M-BurstPA complete! 94200 0:26:20 5th deit chip, use the select-default-chip. Spooky2, Spooky2, Spooky2(0 1dashG 23 5 19)Get chip Invis2*. Manipulate luck to use DashAtkG delete virus in one hit. But DashAtkG has been locked in this 5 slot. I fail to use DashAtkG twice in next 5 battles. So I use select-default-chip to select slot0 as the default chip, and found another way to use DashAtkG twice in next 5 battles. 99500 0:27:49 mission2 complete, and get chip Recov30*. 105100 0:29:23 Problem2: Swordy, Swordy2, Swordy(0atk 1 7wswdL 4VgunL 3wswdL)Get chip FswdN. Taking damage to reduce the level, and get the important chip Guard* from mettaur2 for giving to Jim in the future. 109900 0:30:44 6th editchips, and unlock the select-default-chip. 121200 0:33:53 Trade Trade poismaskS for VarswordB. Get this giltchsword! 139100 0:38:53 Chng.bat 7th edit chips. Only slot0 and slot2 can be used for these 5 battles. Compare RNG, I finally chose the slot0 as VarswordB. TuffBunny, TuffBunny, MettFire(2 3 12 0VarB 4)Manipulate luck to get the important chip ZapRing2B from tuffbunny. Swordy3, Spooky2, Spooky2(0VarB 26 14heatB 3 4)Get chip invis2H. Mettaur2, TuffBunny, MettFire (13 20 7 0VarB 11)Manipulate luck to get the second ZapRing2B for virus battles. 148800 0:41:36 Mother Computer Use glitch to avoid a focus battle. If you use emulator to watch, you can check option-> video->disable SFX, and watch what happened. 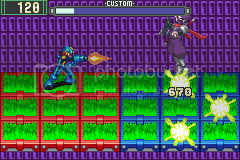 Manipulate luck to use M-Burst to shoot shadowman at the first time. And shoot shadowman 4 times to cost RNG for next battle. 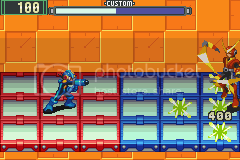 After this battle, megaman got a new style. Now the style point is: CUSTOM 12, GUTS 0, TEAM 0, SHIELD 8. So Megaman got the woodcustom style. 165900 0:46:22 Go to the left door is faster than the right door. I’m surprised such a amazing luck, that I only need to wait about 30 frames for using these 5 spreader chips again, that no need to edit chips. I will explain why I shoot cloud to cost RNG in this battle. It’s not for Entertainment, is for manipulating luck. Wait for the best luck, and try my best to shoot virus most times to cost RNG. 8th edit chips. Use this chip be got just now to replace Guard*. And give Guard* to Jim. 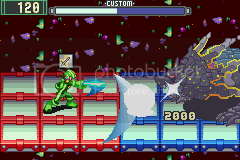 I choose the lest chip-edit, and wait some frames for this M-Burst. 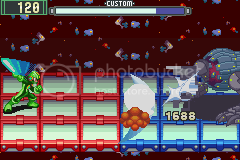 177600 0:49:39 10-chip-trader Now I will explain why I shoot too many times in battles. Because in my first test, I found I have about 500 frames time to get PrismB. I only have 19 chips. I hope I can get PrismB first, and no need to edit chip before beat Protoman, but I have to wait such too long time. So I try to get 3 chips from Mr. Higsby, it cost me 280 frames, but too bad, only 40 frames later, because get chip from this 10-c-t will cost more than 290 frames, too. I can’t trade another chip first. And I would miss a chance that skip chip-edit before beat thunderman. I try to get BrnzFistN from Netopia 2’s GMD to save some frames in virus battle, but take this chip would cost more than 300 frames, still no time. I didn’t have another chance to get chips in the internet. I can get a chip RollR from email, it cost very few RNG, but I have explained I can’t put Roll chips into chip-trader. I can take ticket in airport first, but I would miss a chance that skip chip-edit before beat thunderman, too. Compare these so many projects, I decide to shoot most times in battles to cost RNG, and traded for VarswordB first. Then edit chips and put VarswordB, ZapRing2B x2 and Roll2R this 4 chips into folder(9th edit chips).At last, trade for PrismB. In this time, I play to get only 1 PrismB, I must use more luck manipulation in next run. 189400 0:52:56 Protoman 10th edit chips, use PrismB to replace one ZapRing2B. 200500 0:56:02 Get chip SilvFistE from a muscular man. I’m worried about using slot2 as SilvFistE, because slot0 and slot2 have the max chance be chosen, maybe I should put the second VarswordB into slot2. But after complete this tas, I’m glad to say I win the bet. Can’t choose slot0, but slot 1 4 6 7 8 is nice, too. I still have big chance to use second VarswordB. 290500 1:21:11 I must repeat to say this again, that going to left door is faster than right door. Total be locked at slot1, I don’t want to wait for slot0. The real gamble begin. Manipulate luck to make the second sonic wave hit all 3 virus. Use ZapRing2B to stun the virus. Very dangerous! If I missed this 1 frams, I must wait too many frames for slot0 and slot1. So prismB has been locked at slot 15 14 6 26 7 29. 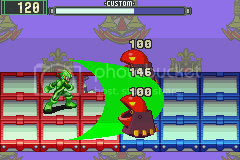 I don’t know why megaman must stand in the far left, otherwise varsword can’t hit prism 6 times. 321300 1:29:47 I prass ↘ 2 frames before jack in, to save 1 frame in the future. 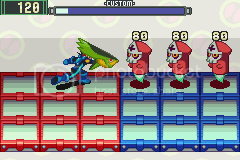 For this 1 frame, I total lost 5frames, because of avoiding random battle. But it is worth to do, This 1 frame is very very very important! 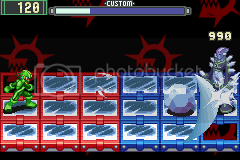 Without this 1 frame, I can’t choose slot0 as prismB, and can’t use only 1 chip-edit to complete last 5 boss battles. Burst hits prism once, RNG pointer +2; Burst hits boss once, pointer +1; Sonic Wave hit prism once, pointer +1. So all of my hits are be used for manipulate luck. 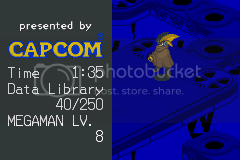 336900 1:34:09 3 Boss Battles For the 1 frame be saved in the past, I finally can use the slot0 as prismB. Manipulate luck to make Gospel to change into Airman, I can hit him earlier. Mothrayas: Replaced submission file with a 77 frames improvement by the author. Mothrayas: Accepting as an improvement to the published movie. Tier will be inherited from its predecessor (Vault).